Shows how to use various features of QSerialPort. 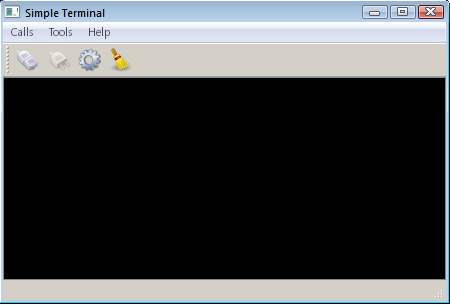 Terminal shows how to create a terminal for a simple serial interface by using Qt Serial Port. This example shows the main features of the QSerialPort class, like configuration, I/O implementation and so forth. Also, the class QSerialPortInfo is invoked to display information about the serial ports available in the system. The asynchronous (non-blocking) approach. Operations are scheduled and performed when the control returns to Qt's event loop. QSerialPort emits a signal when the operation is finished. For example, QSerialPort::write() returns immediately. When the data is sent to the serial port, QSerialPort emits bytesWritten(). The synchronous (blocking) approach. In non-GUI and multithreaded applications, the waitFor...() functions can be called (i.e. QSerialPort::waitForReadyRead()) to suspend the calling thread until the operation has completed. In this example, the asynchronous approach is demonstrated. The Blocking Slave example illustrates the synchronous approach. MainWindow - is the main application window that contains all the working logic for the serial port programming, including configuration, I/O processing and so forth, while inheriting the QMainWindow. Console - is the central widget of the main window, displaying the transmitted or received data. The widget is derived from the QPlainTextEdit class. SettingsDialog - is a dialog for configuring the serial port, as well as for displaying the available serial ports and information about them. In this slot, the settings are read from SettingsDialog and an attempt is made to open and initialize the serial port accordingly. If successful, the status bar displays a message that the opening was successful with the given configuration; otherwise, a messagebox is displayed with the appropriate error code and message. If the serial port settings have never been called SettingsDialog, then the terminal attempts to open the port with the default settings: 9600 8N1. In this case, handled by the closure of the serial port. This slot sends the characters typed in the given Console widget to the serial port. This slot reads the data from the serial port and displays that in the Console widget. Clicking on the Configure button invokes the show() slot which belongs to the SettingsDialog widget. This method displays the SettingsDialog in which the user can choose the desired serial port, see the information about the selected port, and set the desired parameters of the given serial port. See also Blocking Slave Example.